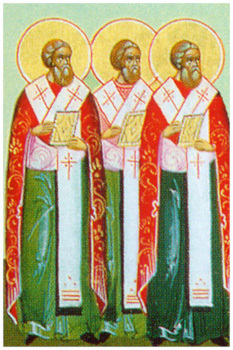 Saints Alexander, John, and Paul, Patriarchs of Constantinople, lived at different times, but each of them happened to clash with the activities of heretics who sought to distort the teachings of the Church. Saint Alexander (325-340) was a chorbishop during the period of the first patriarch of Constantinople, Sainted Mitrophanes (315-325), and because of the patriarch’s extreme age substituted for him at the First Ecumenical Council at Nicea against the Arians (325). Upon his death, Saint Mitrophanes had instructed in his will to elect his vicar to the Constantinople throne. During these times Patriarch Alexander had to contend with the Arians and with pagans. Once in a dispute with a pagan philosopher the saint said to him: “In the Name of our Lord Jesus Christ I command thee to be quiet!” and the pagan suddenly became voiceless. When he gestured with signs of acknowledgement of his errors and affirmation of the correctness of the Christian teaching, then his speech returned to him and he believed in Christ together with many other pagan philosophers. The heretic Arius was punished through the prayer of Saint Alexander. The heretic deceitfully agreed to enter into communion with the orthodox, and the emperor Saint Constantine set a day for receiving Arius. All night long Saint Alexander prayed, imploring the Lord not to permit the heretic to be received into communion with the Church. In the morning, when Arius triumphantly went to the church, surrounded by imperial counselors and soldiers, he was stricken with illness on the Constantine Square – his belly exploded and the innards fell out. Patriarch Alexander, having toiled much, died in the year 340 at the age of 98. Sainted Gregory the Theologian (or Nazianzen, Comm. 25 January) made mention about him afterwards in words of praise to the people of Constantinople. Sainted John the Faster (582-595) Patriarch of Constantinople (582-595), is famed as the compiler of a Penitential nomocanon, which has come down to us in several distinct versions. But their foundation is one and the same. This is an instruction for priests, how to hear a confession of secret sins, whether a sin already committed in act or merely a sin of intent. Ancient church rules address the manner and duration of public penances, established for obvious and evident sinners. But it was necessary to effectively adapt these rules for the private confession of undetected things being repented of. Because of this, Saint John the Faster issued his Penitential nomocanon, so that the good-intentioned confession of one’s private sins, unknown to the world, already testifies to the disposition of the sinner and his conscience in being reconciled to God, and therefore the saint shortened the penances by the ancient fathers by half or more. Yet on the other hand, he set more exactly the character of the penances: severe fasting, daily performing of an established number of prayerful prostrations to the ground, the distribution of alms. The length of penance is determined by the priest. The main purpose of the nomocanon, compiled by the holy Patriarch, consists in establishing penances not simply by the measure of sins, but by the measure of admitting the confessed, and through the appraisal of penitence not by continual punishment, but through the extent of the experience to be confessed, one’s spiritual state. Sainted Paul, by birth a Cypriot, became Patriarch of Constantinople (780-784) during the reign of the Iconoclast emperor Leo IV the Khazar (775-780), and was a virtuous and pious but timid man. Viewing the martyrdom which the orthodox endured for holy icons, the saint concealed his orthodoxy and associated with the iconoclasts. After the death of the emperor Leo, he wanted to restore icon-veneration but was not able to accomplish this, since the iconoclasts were still quite powerful. The saint realised that it was not in his powers to guide the flock, and so he left the patriarchal throne and went secretly to the monastery of Saint Florus, where he took the schema. He repented his silence and association with the iconoclasts and talked of the necessity for convening the Eighth Ecumenical Council to condemn the Iconoclast heresy. Upon his advice, there was chosen to the patriarchal throne Saint Tarasios (784-806), at that time a prominent imperial counselor. The saint died a schema-monk in the year 804.